As the semester winds to a close, the Robert W. Woodruff Library is a busy place, filled with students working on papers and studying for their final exams around the clock. If you’re a frequent visitor to the library, you may be surprised to learn that visitor hours are restricted from December 2 through December 13, 2017. During this exam period, the library wants to give priority access to Emory students; however, visitors who come to view our exhibitions, attend an event or access our government documents may still use the library after checking in with Security at the front of the building. Courtesy borrowers may also pick up items at the Library Service Desk. The Rose Library is also still available to researchers who have an appointment. 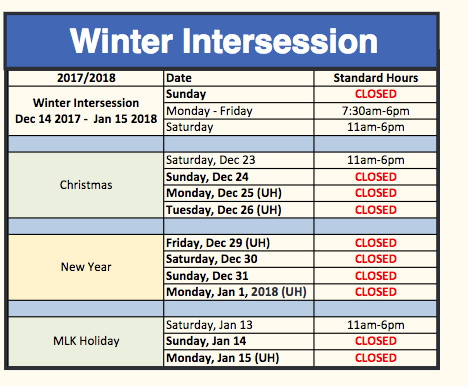 After exams, the Woodruff Library building will enter into reduced Winter Intersession HOURS (Dec 14, 2017- Jan 15, 2018), see table or links below.